In the talk (which is just over 11 minutes, if you have the time and inclination to watch it), I trace some of the ways in which recipes have been popularized (or, in their own way, “gone viral”) over time. From royal whims and fancies to internet sensations, there have always been trends in food. Of course, nothing beats family recipes, which have been passed down over generations and saved in tattered binders, recipe boxes, and memories. I love that so many people have started blogs with the hope that they will become their virtual recipes boxes to be passed down to their children. So today I’d be thrilled if you would share your favorite family recipes from your blogs. From your family’s take on a popular recipe (the famous Smith family potato salad perchance?) or a completely crazy family concoction, what recipes do you cherish and hope to pass on? I’ll be linking up my dad’s Spaghetti and Meatballs and my mother-in-law’s Brisket and Sweet and Sour meatballs (yes, a lot of meat!). Do you think that blogs have replaced recipe boxes as a way of preserving and passing on recipes? Read more about TED here and TEDxBGU here. This is my favorite blog hop of yours yet! Sharing food with family and friends is one of the most important forms of communication! There is nothing better than sitting down and connecting with good conversation and good food. And food communicates love too. My Great Grandma’s Cream Puffs were definitely a way that she communicated her love to her family (getting up at 5 am to make them before everyone woke up). Congrats on being a TED speaker!! I love TED talks, they are so inspiring. And couldn’t agree more about the importance of family recipes. They say smell is one of the strongest links to memory, food can take a person back in time so quickly, it can be such a powerful tool. Wow … congrats on being a TEDx speaker! That is so incredibly awesome! I love the TED talks; as Abby says above, they are truly inspiring … and I cannot wait to listen to yours! That’s awesome Katherine! I posted the Skinnier Chicken parm. 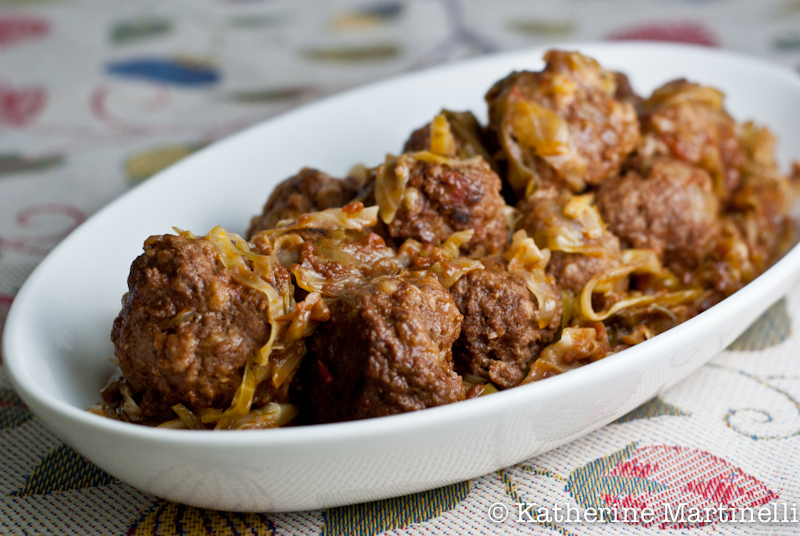 Your meatballs look delish! You did a great job! That’s exactly why I started my blog, to create a virtual recipe box to be passed down to my children. In fact, my grown children already bake/cook from it. i just loved your speech and presentation! You know i;m thinking exactly the same thing and even go further. I’m thinking that my blogs are a really good way for letting my son and later my grand kids who I was, what I loved, and hopefully, they will have the family recipes (by that time they sure be family recipes) handy..
You are so sweet Katherine! I love family recipes, they are the perfect way to stay connected and carry traditions forward! Great theme for a blog hop! I had to search back a ways to find something that the whole family enjoys…and cake it is 🙂 Off to watch your video! I’m not sure if my Toas-tite sandwich is a “family recipe”, but making all kinds of toas-tite sandwiches was a fun thing we used to do as a family and did it often. I’ve carried the tradition into my home, so it might count. The post lists some of my family’s favorites. Interesting presentation with some great information! Good job! Hope you and your family have a wonderful weekend and thanks for hosting this fun hop! So ironic that I don’t share family recipes since my mom taught me how to cook and is a chef. She guards her recipes with a steel door and won’t let me share them. The one I have posted is my healthy take on her Turkey Barley soup. Great post and Ted talk! Loved your talk… I agree 100%, food is communication! I love thinking of my blog as a way to link my past (through my parents, grand parents and great grand parents’ recipes) to my future (my children). I have so many family recipes on the blog, it was hard to limit myself to the 4 linked… I decided to link one from every important cook in my family: my mom’s polpettone, my maternal granny’s fish couscous, my paternal granny’s watermelon jello and my great grandmother’s frittatine! 🙂 Have a great weekend! You know how I feel about food memories. Those of us who are ex-pats really get it but it affects everyone the same. Don’t have one to share, but I love this theme. I should ask my mom for a family recipe! Congrats! You did such a great job! I just shared my Indian Spiced Eggplant (Baingan Bharta), have a great weekend! WOw.. really inspiring..thanks for sharing! I’ll share my mom’s speciality dish that all of my family loves and the recipe I try to carry on. Wow, congrats! Major honor, and very well done. You’re a star! you’re awesome! as is that dress! rock on, friend.